Prague's modern architectural masterpiece: the Dancing House. 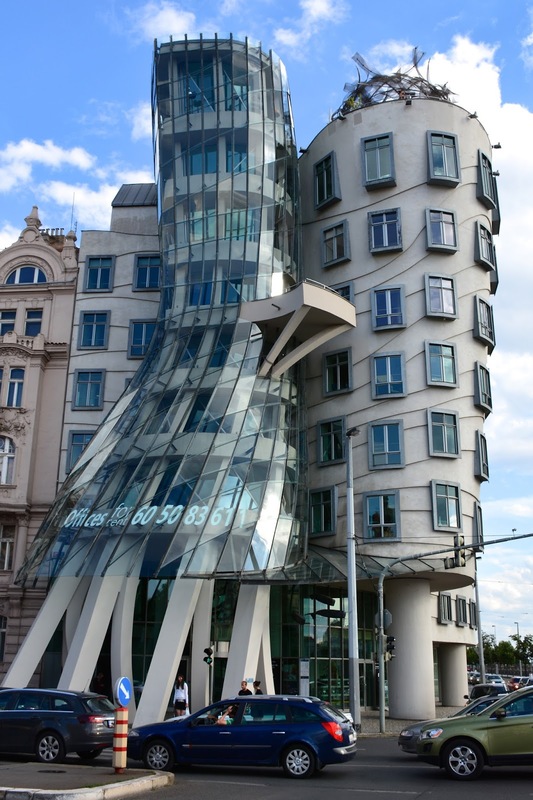 In a city renowned for its abundance of medieval, Baroque, and Art Nouveau architecture, the completion of the "Dancing House" in Prague caused quite a stir. The previous building was bombed by the United States at the end of World War II, and its rubble finally cleared in 1960. Václav Havel, a famed dissident during the nation's communist era, had lived in the building adjacent to the destroyed site since his childhood. Havel's neighbor, architect Vlado Milunić, suggested using the empty corner site for a building in two parts, as though in dialogue with each other. After Havel became the Czech Republic's first president in late 1989, the project got off the ground. Milunić eventually secured the services of renowned Canadian-American architect Frank Gehry, who designed the building in his inimitable style. Gehry glibly nicknamed the building "Fred and Ginger," referencing dancers Fred Astaire and Ginger Rogers. Milunić, on the other hand, saw the building as a reflection of his nation's discourse as it left behind the totalitarian Communist regime and explored its new parliamentary democracy. According to Milunić, Gehry later had misgivings about importing a Hollywood theme to the Prague building. Nowadays, most people refer to it as the Dancing House. The eight-legged female figure leans in toward the male. Her steel and glass dress sweeps out from her. The male figure is more solid yet still light on his feet, with 99 individually-shaped concrete panels undulating its windows down the block. A steel mop of hair swings in the breeze atop his head. The Dancing House, unfortunately, is not a home. Nor is it open to visitors. It serves, rather, as office space. However, an upscale restaurant occupies the top floor, offering fantastic views over the Vltava River toward Prague Castle in the distance. Completed in 1996, the Dancing House was not instantly beloved. But now, two decades on, most residents and visitors acknowledge it as a late-20th century masterpiece. It is the newest gem in a treasure-trove of gorgeous Prague architecture. The Dancing House overlooks the Vltava River in Prague.